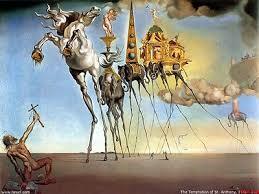 This is a painting by Dalí. It is about 50 years old. Dalí was a Spanish artist. In the painting there are some people, there is a horse and there are some elephants. They have got long legs.